Features: Dadon is a dark brown bear, with curiously long legs. He has a long snout and a 'happy' face. History: Dadon spent the first couple of years of his life working as a theatre bear in the Russian children's theatre 'Grandpa Durov's Corner' in Moscow. In December 2003, he attacked his keeper because he was probably fed-up with being mistreated. The keeper died of the injuries sustained in this attack. An employee of the theatre searched for an alternative home for Dadon because she feared someone would kill Dadon out of revenge. Fortunately, Bears in Mind was contacted soon after the incident. 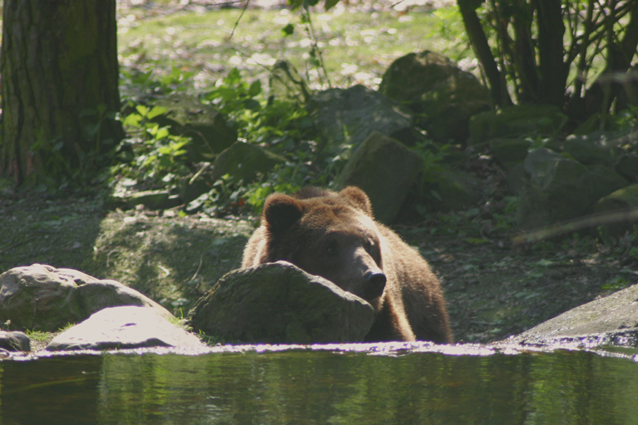 After months of preparations and paperwork, Dadon arrived in the Bear Forest on 18 October, 2004. Special remarks: Dadon is a very playful bear. Some of the other residents in the Bear Forest like to play with him, but sometimes he gets a beating from the other bears if they want him to leave them alone! He loves water and swims a lot in the pond. Dadon gets his name from a fairy tale written by Pushkin: 'Tale of the Golden Cockerel'. The name of the czar in this fairy tale is Dadon. Dadon has been adopted since 11 May 2018 by Willeke Timmerman.